This is a sponsored post through Collective Bias. 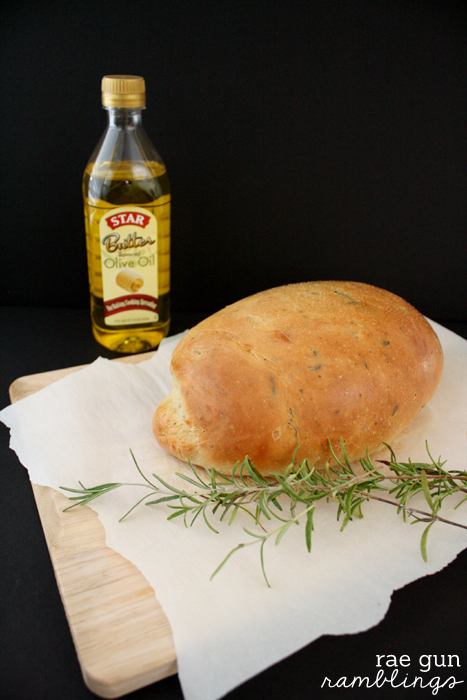 All opinions and ideas are 100% mine and I’m excited to share my experience with Star Butter Olive Oil and one of my favorite bread recipes with you! I love making bread. For me it’s one of those relaxing tasks that is just so satisfying. 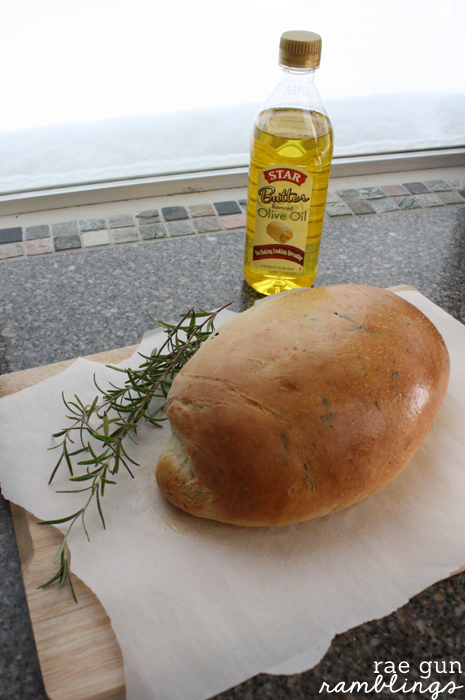 I’ve made this Macaroni Grill Rosemary and Olive Oil Bread Copy Cat Recipe for a while but just haven’t had the chance to share it. 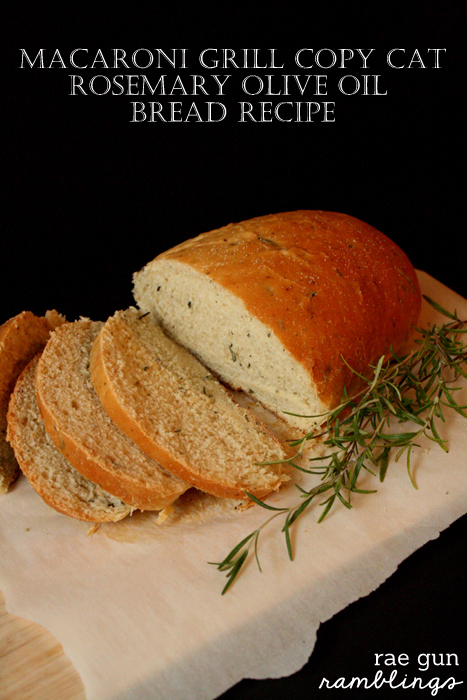 It’s super yummy and when it comes to bread recipes it’s actually relatively easy. This tastes delicious served with a a simple mix of olive oil and balsamic vinegar like they do at Macaroni Grill or just as a side with your favorite soup. 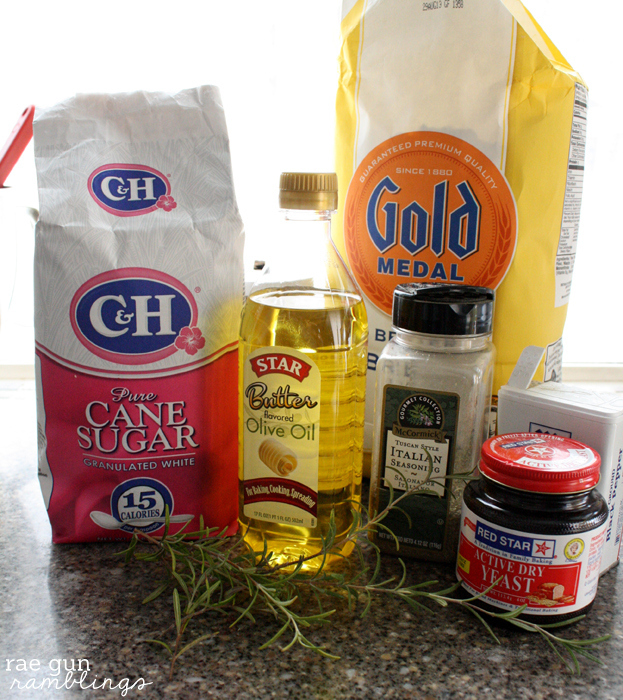 Combine 1/4 C warm water, sugar, and yeast. Let proof for 10 minutes. Mix in herbs, pepper and remaining water. Knead, I use my mixer with a bread hook and mix until the mixture is well combined and pulls away from the bowl. 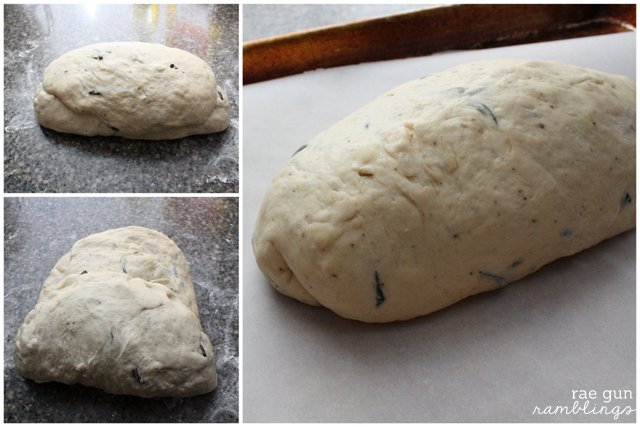 Let rise covered with oil for 1 hour until the dough doubles in size. Fold and shape into loaf. Let rise another hour. Bake at 375 F for about 30 minutes until golden brown and makes a hollow noise when thumped on the bottom of the loaf. While still hot brush or spray with oil and sprinkle generously with salt. Allow to rest before cutting. This is one of my favorite bread recipes I’m not sure why it took me so long to share it here. I hope you enjoy it. When I saw the new Star Butter Olive Oil at Walmart I was really curious to try it out with this recipe. It turned out great. I loved the fact that it works more like vegetable oil and butter but is actually healthy olive oil. I’ll definitely be experimenting with this more in my cooking I’m thinking I’ll try it with my Cranberry White Chocolate Cookie Recipe this weekend. Be sure to check out the giveaway Star is running on their facebook page to get a free bottle to try yourself. This looks AMAZING!! We’re making “cold weather” soup tonight and I think that I need to make this with it. This looks delicious! I can almost smell it! I’s the perfect weather for warm bread even here in Las Vegas. This looks so good! I am not a bread maker but seeing this makes me want to try it right now!! Oh yum I love this bread! And my sister is a huge fan of rosemary. 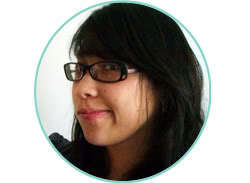 I’m pinning it so we can make it while she visits from college! Thanks for the recipe! Mmmm I have a copycat recipe too! I wonder how similar they are, I LOVE this bread. I’ll have to try your recipe out too! We love dipping our bread in oil with flavors in it. My kids beg for it. Yum! Oh wow, this sounds so good. My husband would love this, too!